The Marina Palace Prestige Apartments are located on a glorious spot on the seafront where guests can enjoy the views out to sea and can listen to the sounds of the waves as they crash against the rocks. The Marina Palace Prestige Apartment’s spacious lobby area is bright with modern furnishings has a 24 hour reception desk offering services such as currency exchange, luggage storage, babysitting service, rental of safety deposit boxes, tourist information and excursion ticket sales for some great days out. There are many other facilities and services within the hotel grounds including a chargeable laundry room, supermarket, a porter are available to assist through the summer season and there is now a 24 hour security system to ensure that guests can enjoy their holiday in a safe environment. Guests wanting to keep updated with friends and family back home or catch up on the latest gossip can take advantage of the free Wi-Fi that is available throughout the whole complex including the apartments. For those wanting to still keep in shape there is a gym with all of the latest fitness equipment, a tennis court and for the children, there is table tennis, a billiards table, a children's playground and fun filled days organised by the kids clubs. The outside sun terrace has a large amount of sun loungers with parasols and which surrounds the very inviting swimming pool, where the fun happens with games of waterpolo and the children can have fun in the sun in the children's section of the pool. The pool bar is open until the sun goes down, offering an abundance of cold refreshing drinks and hot and cold food at your request. Guests can enjoy this on the patio furnished with tables and chairs, or at the comfort of their own sun lounger. After tans are topped and a fun time has been had by the children, guests can then look forward to a lovely evening meal at the buffet style restaurant, with a large selection of delicious dishes for the whole family to enjoy and the desserts which are a real hit with the little holiday makers. You do not need to go looking for entertainment in the resort as the hotels entertainments team have a daily program of fun shows for everyone, which starts off with the mini disco for the children and cabarets, live music, quiz nights will follow on to ensure all guest have a fun night. The apartments are bright and modern with traditional style furniture and have summer colours throughout. All apartments have a double or twin beds, living area with a sofa bed, satellite TV, telephone. air-conditioning, chargeable safe, free Wi-Fi, fully equipped kitchen, private bathroom with a bath or shower, hairdryer and a balcony or terrace with street, pool or sea views. 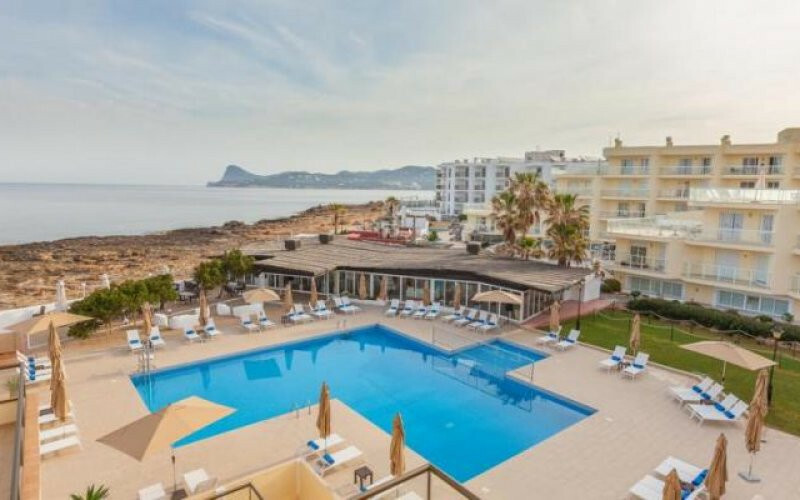 The Marina Palace Prestige Apartments have luxury, location, facilities and also service on its side to appeal to families, couples and groups of friends wanting something a bit special for their trip to Ibiza.